Bunny Munro sells beauty products and the dream of hope to lonely housewives along the south coast of England. Set adrift by his wife's sudden death and struggling to keep a grip on reality, he does the only thing he can think of—with his young son in tow, he hits the road. While Bunny plies his trade and sexual charisma door-to-door, nine-year-old Bunny Junior sits patiently in the car, exploring the world through the pages of his encyclopaedia. As their bizarre and increasingly frenzied road trip shears into a final reckoning, Bunny finds that the ghosts of his world—decrepit fathers, vengeful lovers, jealous husbands, and horned psycho-killers— have emerged from the shadows and are seeking to exact their toll. 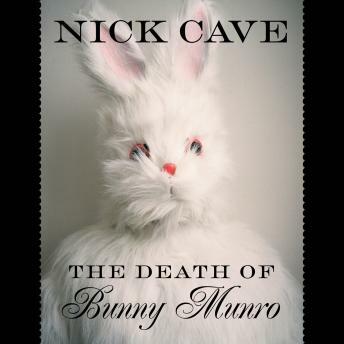 A tender portrait of the relationship between father and son, The Death of Bunny Munro is a stylish, angry and hugely enjoyable listen, bursting with the wit and mystery that fans will recognise as hallmarks of Cave's singular vision.